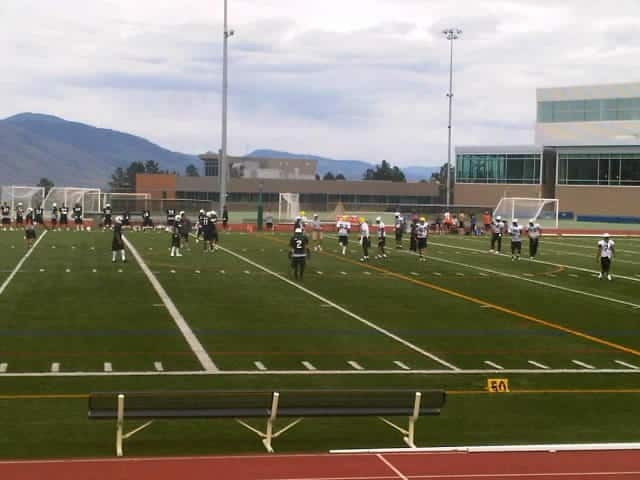 Welcome to our live blog of the BC Lions June 6th, afternoon session from Kamloops. Refresh for new highlights as they happen. 4:00pm: The weather is once again perfect for football, clouds and some sun with a nice breeze as the players take to the field for the afternoon session. 4:05pm: The players have broken into positional groups to work on some basic formations and schemes. 4:26pm: The players are working individual drills right now, tackling dummies, foot agility, receiving. Secondary is working breaking on the ball. 4:38pm: QB’s are working on routes with receivers, Secondary working opn man coverage drills. Jim Mullin of CKNW and “The Mullin Files” here on BCLionsDen is in attendance. 4:53pm: For the second straight practice Anton McKenzie is not in pads and is running (jogging) around the field. New president Dennis Skulsky is enjoying camp, shaking hands with players and media. 5:05pm: once again the defense is looking the sharper of the two sides early. Jamal Robertson drops a laser beam Printers throw. 5:22pm: JR LaRose picks off Kyle Parrish. Emmanuel Arceneaux is catching everything. 5:30pm: Offense surrenders another interception to the defense. Dominique Williams gets it off a tipped Printers pass. 5:42pm: Team is working on special team coverages (walk throughs). 5:46pm: First field goal work of camp. McCallum getting the first reps.
5:51pm: both kickers miss a fieldgoal, otherwise not much to choose. Onto the scrimmage. 5:52pm: First play from scrimmage Jamal Lee catches a pass out of the backfield and takes it to the house. 6:08pm: 2nd scrap of camp. Passmore and Toney exchange punches. Very physical camp for day one! 6:16pm: Toddrick Pendland and Yonus Davis with back to back long runs for TD’s both looking extremely quick! Stars of the session: Jamal Lee, Darius Passmore, Crawford, Haley, Yurichuk, Printers, Arceneaux, Pendland, Y. Davis, Washington. The offense made up for a slow start and owned the scrimmage at the end of practice.